All rooms are air-conditioned, facilities include a television with satellite channels, minibar, safe, fire alarm and internet connection. Bathrooms with tubs or showers are equipped with hairdryer, bathrobes, cosmetic mirror and cosmetic accessories. Our guests are able to use our restaurant and bar, as well as a sauna, gym and hot tub. In the evening, you can enjoy the snack bar where grilled steaks are prepared. For hotel guests are offered dinners, you can choose from a daily menu compiled from both traditional Czech dishes and international cuisine. 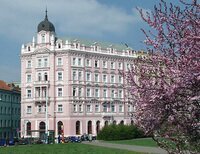 Hotel Opera is located in the city center, close to the shops, banks, shopping centres and historical sites. 5 stops by metro from the station Florenc, which is located 3 minutes from the hotel Opera. Clarion Congress Hotel is located directly next to the stop Vysočanská.